A house in the woods to serve as a grief house?? What could possible go wrong, especially next to something called the "Grieving Stones" which feed off the grief the patients in the weekend counseling session emit. Atmospheric horror at its best, you'll be hard pressed to find a better novella in the "haunted house" genre. Chris Barnes heightens this with his stoic delivery, drawing you into the darkness and never letting go. This is a book to be listened to at night, with the lights off, and no other distractions. A therapy group for people dealing with loss and grief heads off to a dilapidated house in the country for a slightly unconventional weekend session to tidy up the house. Grief House has its own creepy history set within local folklore. The story is told from the point of view of Alice, who recently lost her husband, and who begins to feel a deep affinity with the house. Right from the start, this was a very atmospheric story with a menacing sense of doom. Gary McMahon's writing was excellent. This was my first time listening to any of his work, but it definitely won't be my last. I was really impressed with the way he managed to flesh out the characters and make them into believable people with real emotions. He also created this dark and brooding atmosphere and described the scenery so vividly, all within 150 pages. At just under three hours, this was a great one to listen to in one sitting. The Grieving Stones wasn't a blood and gore horror story, it was very subtle and looming instead focusing on the classic sinister house/ghost elements. The author skilfully combined this with mental health issues. The punch dummy and the Backwards Girl were clever ideas and truly frightening. There were some scenes involving animals that I found rather unsettling, but that's just one of my personal don't-cope-well-with triggers. Listening to Chris Barnes narrate this story was a total delight. His voice was clear and really pleasant to listen to. I loved his Scottish accent. He varied tone and delivery sufficiently to give each of the characters a distinct voice. He really knew how to accentuate the chilling, creepy atmosphere and how to evoke the necessary emotions, but he did so in a fairly understated, measured manner. Very professional! I will definitely look out for more audios by Chris Barnes. There were no issues with the production of the audio. Quite unusual for me, but I have no complaints whatsoever... except maybe, it could have been a longer story. Highly recommended as a short, classic horror story! I listened to this one on audio and it was excellent. The writing was dark and brooding and the narration by Chris Barnes really added some extra atmosphere. There were some good characterizations, as well for such a quick work, which clocked in at just under 3 hours. A field trip group therapy session to a place called Grief House may not have been the best idea. Just sayin’. What did you like most about The Grieving Stones? What does Chris Barnes bring to the story that you wouldn’t experience if you had only read the book? I bought this book because Chris Barnes had been highly recommended as a narrator and I wasn't disappointed. His wonderful Scottish accent is perfect for this type of story. He strikes exactly the right tone and I found myself holding my breath through the whole book. Wonderful I shall be listening to more by this narrator. 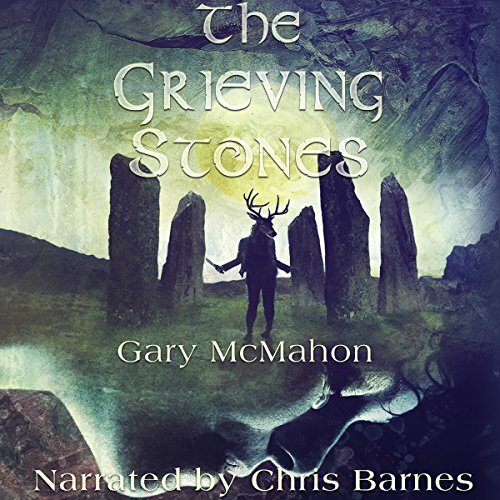 Where does The Grieving Stones rank among all the audiobooks you’ve listened to so far? The Grieving Stones is easily the best audiobook I have listened to so far from Audible. The narrator's measured, sombre delivery perfectly matched the tone of the words and the flow of the narrative. He didn't miss a beat in terms of creating an atmosphere of accumulative terror. This is my first listening to Chris Barnes and will not be the last. The denouement of the story was where it came into its own and the narrator evoked the necessary emotions perfectly.